Here is a collection of photos from the conference taken by Dennis, and Ron (Dennis’s dad). Organized in conjunction with the Alliance Française, there were two primary events held on Friday and Saturday night. Marie-Hélène Huet (Emeritus Professor of French, Princeton University and Affiliate Faculty of MIT) delivered the keynote address “Journeys to Worlds Unknown: From Jules Verne to Modern Science-Fiction” on Saturday night. During the event Brian Taves was interviewed for Radio NOLA Alliance Française podcast and other members were interviewed at the Saturday night event at the US Mint. - William B. Jones Jr., NAJVS Inc.
-	There will be a $5 cover charge for this event. 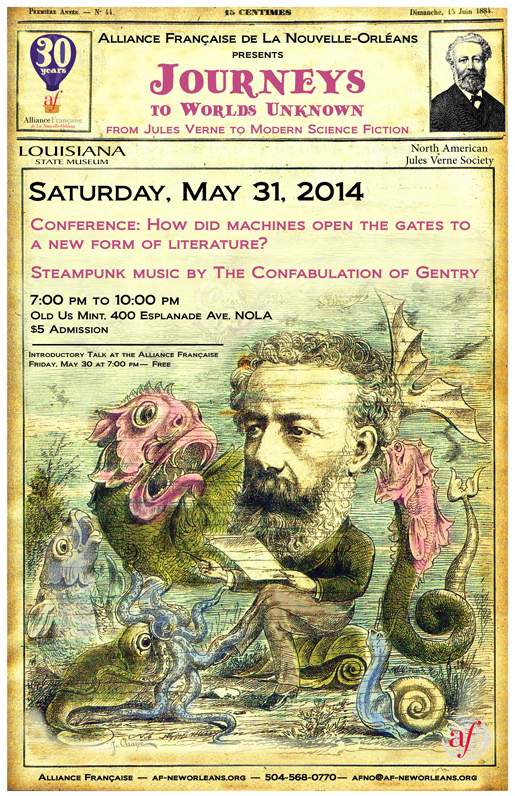 - Prof. Milo Reginald Pinkerton’s Confabulation of Gentry — New Orleans’ Masters of Steampunk Spectacle!